Two weeks after the Battle of Endor, the Empire is claiming the Emperor is still alive and any claims otherwise are purely Rebel propaganda. Rebel and Imperial forces are still fighting all over the galaxy, though the tide is definitely turning in favor of the Rebels. Bey has been running a lot of flight missions. Her husband, Kes, has been running missions with Han Solo as a member of a special forces unit. We find out that their son, Poe, has been staying with his grandfather. Bey is assigned to serve as the pilot for Princess Leia for a important, covert mission to Naboo. As they arrive, several Star Destroyers arrive to secure the planet claiming to be under orders from the Emperor. The action sequences early in this book showing Rebel forces trying to drive the Empire out of Cawa City on Sterdic IV were awesome. I especially loved seeing the Rebels come up with another clever way to take down an AT-AT walker. I also liked the political intrigue of Imperial officers doing everything possible to hide the truth about the Emperor's death. The Empire has always ruled through fear, so it makes sense that they would want to keep the Emperor's fearsome image in place to convince the public that nothing has changed. I was reminded of one of my favorite Robot chicken sketches. This comic makes it real clear the war wasn't over. Leia's trip to Naboo was definitely notable. They mention that she's been there before (in the PRINCESS LEIA mini-series set after A NEW HOPE). But it's clear that neither Leia nor the people of Naboo know about her connection to the planet. I thought that was an interesting plot twist. I wonder if Leia ever finds out who her mother is. I was real curious about the fact we find out that Poe was already born and lives with his grandfather. The first issue didn't give me that impression. I was thinking Rey got pregnant at the end of the issue, but clearly that is not the case. I am starting to think that Rey and Kes both end up dead in this series. It was suggested in MOVING TARGETS that Leia is pretty close to Poe. Maybe his mother died protecting her on Naboo, which makes Leia feel a certain debt. Yeah, I am really anxious to see how all the pieces of JOURNEY TO THE FORCE AWAKENS fit together. The art on this issue was great. I was a little concerned when I saw three artists listed (there was only one on the first issue), but it never felt like art by committee. I guess the extra artists were to meet the odd release schedule. Issue 3 comes out just a week after this issue. 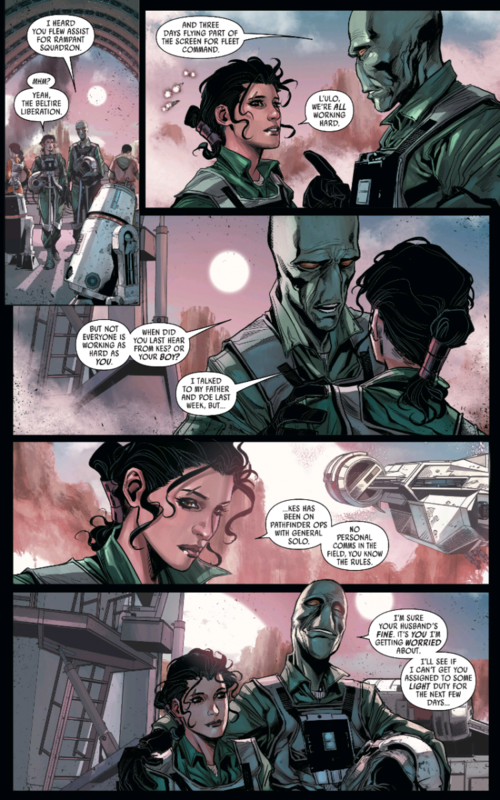 Rucka continues to write a very good Star Wars comic. I am happy that we're finally getting a better sense of what happened after RETURN OF THE JEDI. The new continuity is finally starting to feel a lot clearer as we get closer to THE FORCE AWAKENS release in December. JOURNEY TO THE FORCE AWAKENS has been a lot of fun and full of high quality comics and novels. Some of them haven't quite shed as much light on THE FORCE AWAKENS as I would have liked, but SHATTERED EMPIRE is at least giving us some back story for Poe. I am still not quite sure this comic is all that necessary, but I do enjoy it. Loved seeing Leia heading to Naboo. Suffers from the same "does this need to exist?" as a lot of Journey to the Force Awakens. Too many teases, not enough substance. Is it worth your $3.99? If you're a Star Wars fan, it's worth buying. 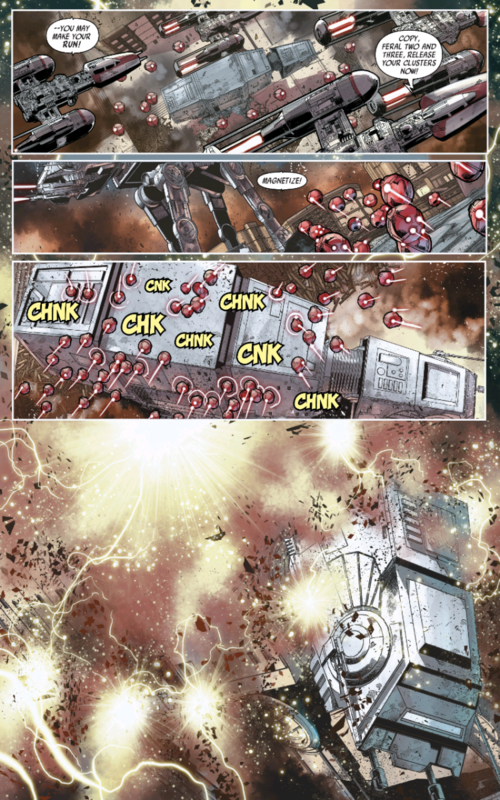 Marvel has done a solid job with their Star Wars comics, and this one is no exception. The next issue does come out next week, so that might impact your buying habits.